Chemistry is the science of the elements. This science deals with the properties and chemical reactions of the elements and their compounds. Chemistry also includes the study of how these elements and compounds can be formed. Inorganic chemists study of the structure, properties, and reactions of the chemical elements and their compounds. Inorganic chemistry does not include the investigation of hydrocarbons-compounds composed of carbon and hydrogen that are the parent material of all other organic compounds. The study of organic compounds is called organic chemistry. Physical chemists develop and use instruments to probe the physical properties (such as density, viscosity, and crystallography) of compounds as well as the behavior of chemical systems. Analytical chemists work to determine the unknown chemical constituents of substances and the relative amounts of these constituents. The Associate of Science in Chemistry provides the first two years of course work towards a Bachelor of Science degree. The completion of the following courses (in the attachment below) is appropriate for those planning to transfer to a four-year college or university to complete a major in chemistry. You are urged to consult with a chemistry faculty advisor before beginning any program of study. 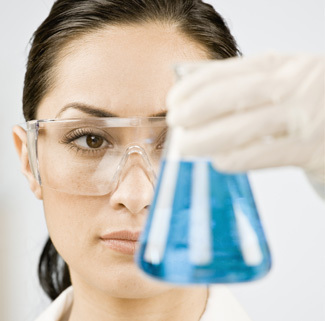 These courses provide the basic preparation leading to Chemistry related careers. Some courses might not be offered each semester. Please click here to view Chemistry degree.